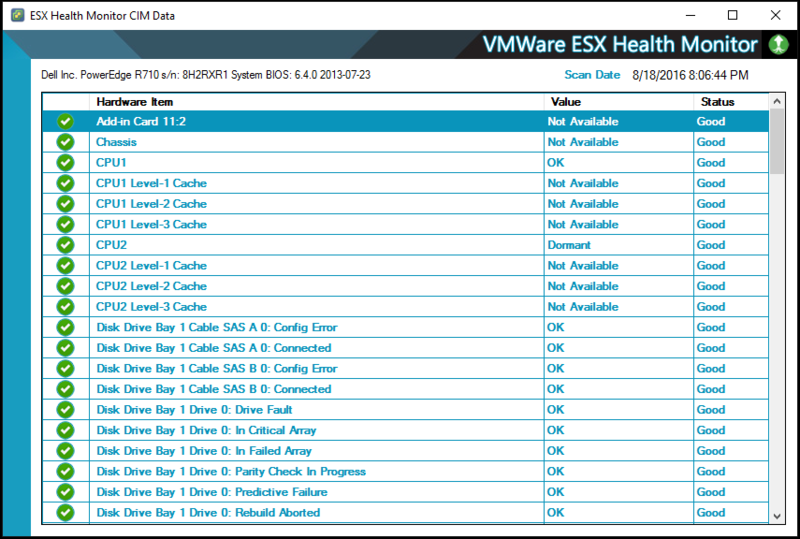 The main view lets you see all the ESX hosts under management sorted by Client. In this view you are able to turn on and off the collection of data, set the interval of how often the data is collected and enable alerting for any seen failures. 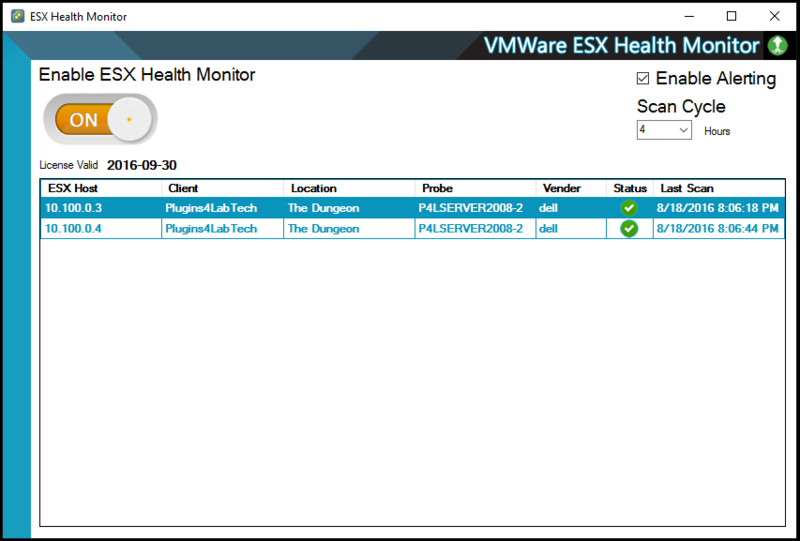 The Client Console tab is where you would add and delete the ESX Hosts you want to monitor. 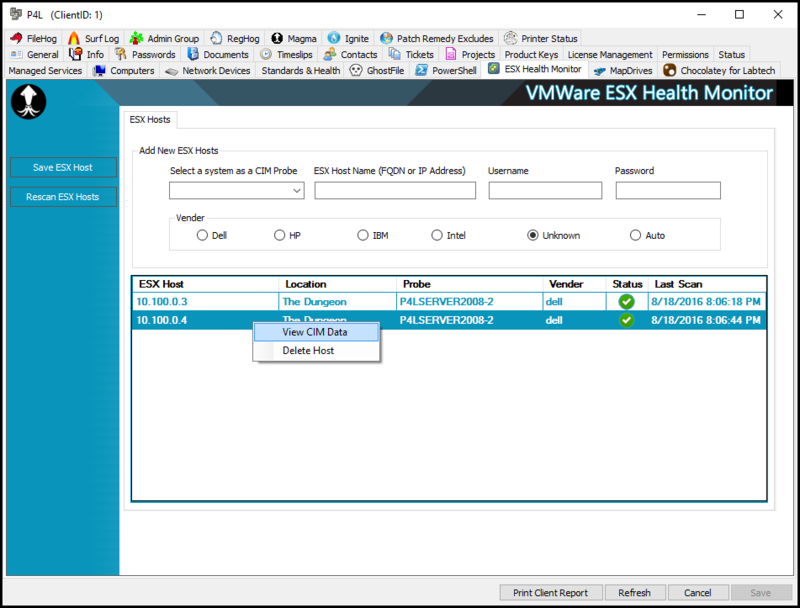 You are able to force the update of ESX CIM data by selecting to rescan ESX hosts and you can view the full CIM data list of any ESX Host. The CIM Data view shows all the collected CIM data on a given ESX host. If any data is in a state not considered ok then those lines will be represented with warning and alarming icons. You will also get the hardware manufactures data back and in the case of Dell that is the Hardware type and Service Tag. Under the main view you can select to enable alerts. When you do this agent is created in the internal monitors of LabTech. You can use this monitor to email, ticket, alert or message anyone when failures are picked up. A simple plugin all self contained and easy to deploy. Just a few clicks to configure and you have data. So easy to use anyone can setup and have it working in just a few minutes. Thanks, guys! Is this a replacement for your previous ESXi plugin, or is this ESX-only? Yes, it is a new and improved remake of the original. What has changed is it is now fully self contained. You install the DLL to LT server and that is it. The plugin does the rest for you. No more groups, no more scripts imports, no more supporting files to manage just install and add hosts. We also fixed many things that were just broken in the original. We just released build 4.0.0.15 to the Squad last night which has added several new features to what we had already released to the squad. So this guy is really shaping up to be a leader in VMWare management for Labtech. Hi Cubert, this looks awesome! I was wondering if you’re going to keep this as a free plugin (like previous versions)? Or will this be trial/paid only? Either way, looking for to taking this for a test drive. How do you get the alerting setup? We have alerting enabled in the main view and the internal monitor was created. We can not get it to actually alert us though.